The LIINES is happy to announce the publication of the journal article “The need for holistic enterprise control assessment methods for the future electricity grid”, by Prof. Amro M. Farid (Dartmouth), Bo Jiang (MIT), Aramazd Muzhikyan (Dartmouth), and Prof. Kamal Youcef-Toumi (MIT) in the journal Renewable and Sustainable Energy Reviews. In this comprehensive literature-based study, the LIINES presents a logical case for integrating power grid assessment methods into a holistic enterprise control framework. Such a framework is explicitly techno-economic and merges methods power systems engineering and economics. To support the argument, the LIINES has conducted the most comprehensive review of renewable energy integration studies completed to date. The paper discusses the need for change in the assessment of the electricity grid as a result of five driving forces. The driving forces are identified as: decarbonization, growth of electricity demand, transportation electrification, electric power deregulation, and increasing numbers of responsive (“smart”) consumers. These five drivers require the steadily increasing penetration of solar and wind generation as well as evolving capabilities to support demand side management for the tremendous diversity of loads that connect to the electrical grid. The integration of these three new grid technologies of renewable energy, electric vehicles, and demand side resources ultimately imposes fundamental changes to the grid’s structure and behavior. The paper argues that the future electric grid’s needs for reliability, cost efficiency and sustainability necessitates a holistic assessment approach. Figure 1 shows a guiding structure that leads to five techno-economic control objectives. This work also uses five lifecycle properties to integrate rather than decompose the engineering design. The lifecycle properties core to the power grid are dispatchability, flexibility, forecastability, stability, and resilience. The use of these five properties avoids overlap in function of solutions. Using such a holistic paradigm for techno-economic assessment, the journal paper conducts the most comprehensive review of renewable energy studies completed to date. It found several limitations to the existing renewable energy integration studies. Firstly, in order to address the holistic nature of the power grid, the real potential of demand side resources needs to be included. Additionally, for power grid balancing, validated simulations rather than statistical methods based on questionable assumptions need to be used. Furthermore, the consistency between future development of the real market structure and modeling methods needs to be assured. Finally, the investment costs related to the support of the future power grid need to be considered in simulation. Accounts for the consequent changes in operating cost and the required investment costs. These requirements have been realized in a power grid enterprise control simulator that was used for an extensive study of renewable energy integration in the power grid [Link 1], [Link 2]. The simulator includes the physical electrical grid layer and incorporates primary, secondary, and tertiary control functions. This model fits the requirements of the holistic enterprise control method as defined previously. On Tuesday May 17, 2016, Prof. Amro M. Farid presented at the Third International Conference and Workshop on Transactive Energy Systems in Portland, Oregon. The presentation entitled: “Microgrids as a Key Enabling Transactive Energy Technology for Resilient Self-Healing Power Grid Operation” featured some of the LIINES’ recent research on resilience in power systems. Building upon the recent IEEE Vision for Smart Grid Controls, the presentation advocated the concept of resilience self-healing operation in future power grids. This continues to be an important area of LIINES research and has been the subject of several recent blogposts. (See here, here and here). The concept of resilient power systems effectively means that healthy regions of the grid can continue to operate while disrupted and perturbed regions bring themselves back to normal operation. A key technology enabling this resilience is microgrids because they are often able to island themselves from the rest of the grid and continue to operate successfully. In this presentation, the microgrids were controlled with a transactive energy control architecture that couples several control layers to achieve both technical reliability as well as cost effectiveness. Furthermore, the presentation showed the ability for several microgrids to self-coordinate so as to demonstrate “strength-in-numbers” when adverse power grid conditions like net load ramps and variability arise. The presentation concluded with the need for significant new research where transactive energy control concepts are intertwined with recent work on power grid enterprise control. In depth materials on LIINES smart power grid research can be found on the LIINES website. The LIINES is pleased to announce the acceptance of the paper “An Axiomatic Design of a Multi-Agent Reconfigurable Mechatronic System Architecture” to the IEEE Transactions on Industrial Informatics. The paper is authored by Prof. Amro M. Farid and Prof. Luis Ribeiro. Recent trends in manufacturing require production facilities to produce a wide variety of products with an increasingly shorter product lifecycle. These trends force production facilities to adjust and redesign production lines on a more regular basis. Reconfigurable manufacturing systems are designed for rapid change in structure; in both hardware and software components to address the required changes in production capacity and functionality. Qualitative methods have recently been successful in achieving reconfigurability through multi-agent systems (MAS). However, their implementation remains limited, as an unambiguous quantitative reference architecture for reconfigurability has not yet been developed. 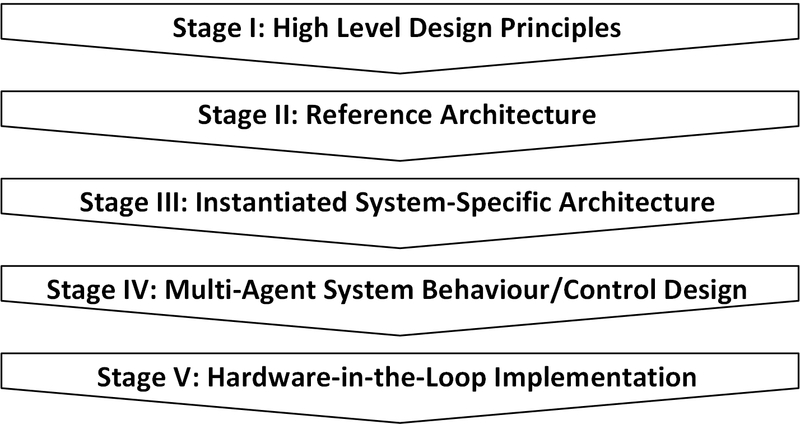 A design methodology based on quantitative reconfigurability measurement would facilitate a logical, and seamless transition between the five stages of the MAS design methodology, as shown below. The degree to which existing designs have achieved their intended level of reconfigurability. Which systems are quantitatively more reconfigurable. How these designs may overcome their inherent design limitations to achieve greater reconfigurability in subsequent design iterations. In order to address the previously mentioned issues with existing design methodologies, this paper develops a multi-agent system reference architecture for reconfigurable manufacturing systems driven by a quantitative and formal design approach, directly in line with the above Figure. The paper uses Axiomatic Design for Large Flexible Engineering Systems to support a well-conceptualized architecture, which is necessary for excellent production system performance. Additionally, Axiomatic Design highlights potential design flaws at an early conceptual stage. This results in the first formal and quantitative reference architecture based on rigorous mathematics. Wester C.H. Schoonenberg completed his B.Sc. in Systems Engineering and Policy Analysis Management at Delft University of Technology in 2014. After his bachelors’ degree, Wester started his graduate work for the LIINES at Masdar Institute, which he continues as a doctoral student at Thayer School of Engineering at Dartmouth College in 2015. Currently, Wester is working on the integrated operation of electrical grids and production systems with a special interest in Zero Carbon Emission Manufacturing Systems. The LIINES seeks 1-2 quantitatively-minded Dartmouth undergrads for participation in a smart grid research competition. This work is a direct extension of our prior work in the smart power grid research theme. The competition involves multi-agent system negotiation techniques as applied to power system operations and management. The work can serve as part of a senior thesis or an undergraduate research opportunity. The successful student(s) will be driven by a sincere interest in the smart grid field and have an affinity to object-oriented programming. Engineering science or computing science majors are preferred although preparations in heavily computational disciplines such as physics, applied mathematics, and economics are welcome. A prior portfolio in an object-oriented programming language is required. C++ is specifically preferred. More senior undergraduate students are preferred although initiative, interest, and programming fluency will be the determining criteria. Interested students may contact Prof. Amro M. Farid for further information and an interview.